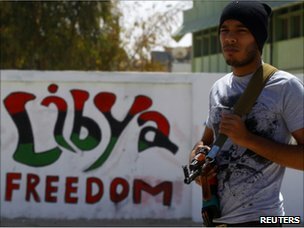 Rebel leaders and Nato have dismissed a call by Libyan leader Muammar Gaddafi for a ceasefire and negotiations. The Benghazi-based rebel Transitional National Council said Col Gaddafi’s offer was not credible and that the time for compromise had passed. Nato officials said the alliance would not consider talks until government forces stopped attacks on civilians. In a televised speech, Col Gaddafi said he was ready to talk to the US, UK and France if they stopped air strikes. Officials had earlier warned rebels in the besieged city of Misrata that they had four days to lay down their arms or face an all-out assault. In a rambling speech early on Saturday, Col Gaddafi called for a ceasefire and negotiations with Nato member states and the rebels. Col Gaddafi denounced the rebels as foreign terrorists and said there could be no preconditions, such as his own surrender and exile. “I have no official functions to give up – I will not leave my country and will fight to the death,” he vowed. But the vice-chairman of the Transitional National Council rejected the offer of negotiations, saying the Libyan leader had “offered ceasefires only to continue violating basic human rights, international humanitarian law, and the safety and security of Libya and the entire region”. Another rebel spokesman told the BBC that only Col Gadaffi’s forces could cease fire because they had all the weapons. In Brussels, Nato officials also rejected the offer of talks. During Col Gaddafi’s speech Nato reportedly bombed a government complex that included the state television building in Tripoli. 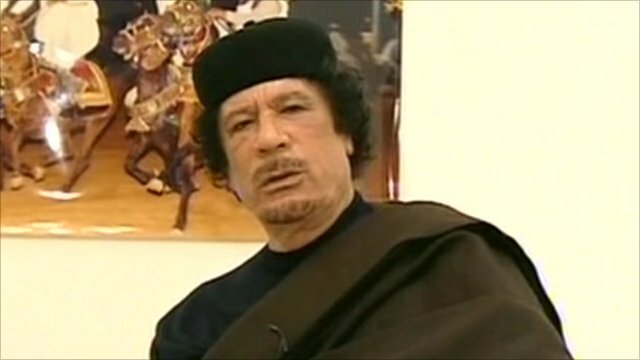 The Libyan government said the strike was meant to kill Col Gaddafi. Nato said it had targeted one command and control building and a self-propelled artillery piece in the vicinity of Tripoli on 29 April. It also hit government military vehicles and ammunition stockpiles in the towns of Zintan, Brega and Sirte, a statement added. Nato also said its warships had intercepted several small boats laying mines in the sea near Misrata’s port to stop legitimate aid shipments. Human Rights watch said two mines had been destroyed while a third was being monitored. The alliance did not give details but said the process would take time. 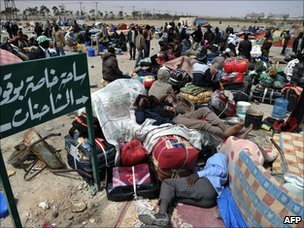 The port is a lifeline for rebel fighters and residents in the city, allowing them to receive supplies of food and medicine, and enabling the evacuation of the wounded and of stranded migrant workers. “All the humanitarian missions are stopped now because they can not get any humanitarian aid inside,” said Fadl Moukadem of Mercy Corps. Government spokesman Moussa Ibrahim said he was unaware of any attempted mine-laying. However, he said Col Gaddafi’s forces had been trying to prevent weapons shipments reaching the rebels in Misrata by sea. He said any aid shipments had to be co-ordinated with the government and should preferably be transported overland. He also warned that if rebels in the Libya’s third largest city did not lay down their arms in return for an amnesty, they would face “total fire”. On Saturday, heavy fighting continued in the southern part of Misrata, near the airport. Some reports suggested up to 10 people had died. The BBC’s Ian Pannell in Tripoli says that despite claims loyalist forces are in control of Misrata, it seems that the government is on the back foot, under pressure from Nato and desperate to reverse recent losses.